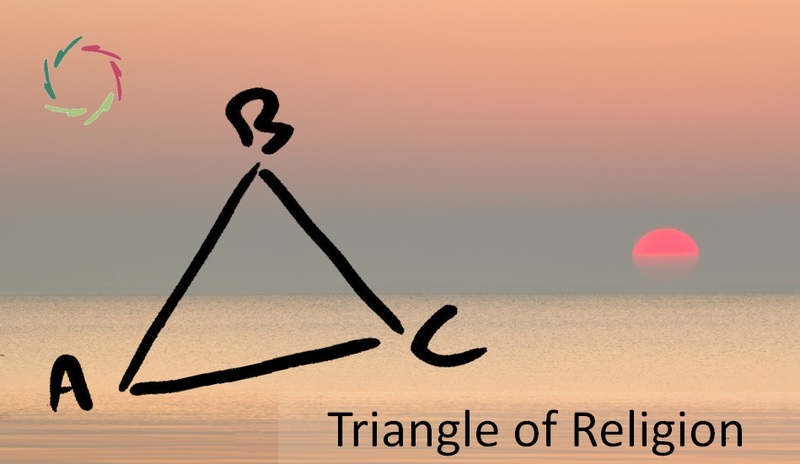 This triangle is a ‘landscape of religion’ at a conceptual level, showing ‘Open Religion’ as part of this landscape. Concrete religions or ‘ways to experience religion’ are situated somewhere within the triangle, not therefore at the corners or sides. Within the triangle, you see a circle. This is where, as I see it, most individuals are situated at present. Of course, many are situated outside of this circle. Please see this as abstract. The only goal is to depict something very schematically. For instance, the surface of this circle can be very different in reality. which I would call ‘naïve religiosity’. This is a kind of ‘primitive’ form of thinking in which no distinction is made between conceptual and non-conceptual religiosity. The distinction is just not alive within the mind of the ‘adherent’ who simply goes with the flow. According to many historians, this was the way that the ‘common man’ mostly experienced his religiosity also in the West even until a few centuries ago. Completely disregarding this may lead to huge misunderstandings about where ‘religiosity’ comes from… and where it might relatively easily go to. ‘Primitive’ is not used here in a denigrating way. I think it overlaps quite a lot with ‘Open Religion’ which is of course dear to me. Moreover, this overlap is very relevant. Again: this is very abstract-schematic. The corners are not about individual religions. The terms that I use are also nothing more than terms: pointers to abstract ‘entities’ (concepts) that don’t necessarily correspond with existing individual elements of the real landscape. In other words: this is a map of a conceptual ‘landscape of religion’. Here, ‘God’ is treated like something objectifiable, an ‘instantiation’ of some humanly knowable and understandable concept. Most childishly, it looks like Santa Claus. Less childishly, it looks like anything that you can describe on a piece of paper without ‘involvement of the heart’ of any kind at all. A religious concept-ist pretends to see the truth in (his) God(s). Not being an expert in religions, I do recognize it in many cases of ‘fundamentalism’. or one might say: ‘a-religious atheism’. 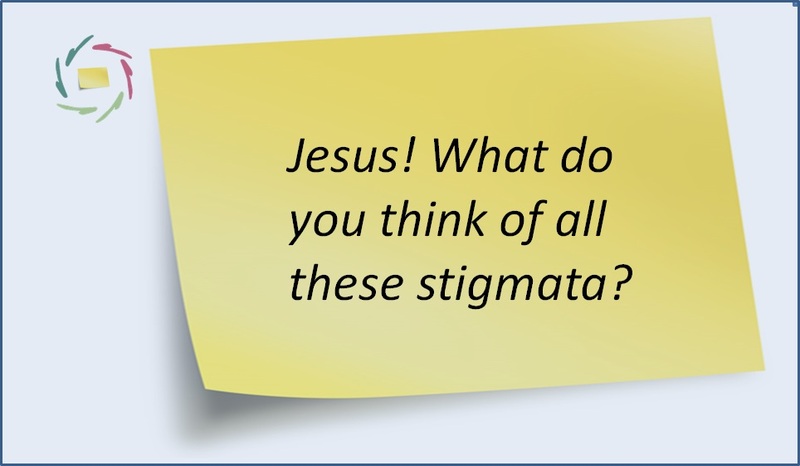 A religious nihil-ist pretends to see the truth in nihil. The ‘open’ here points directly to ‘subconceptual’. 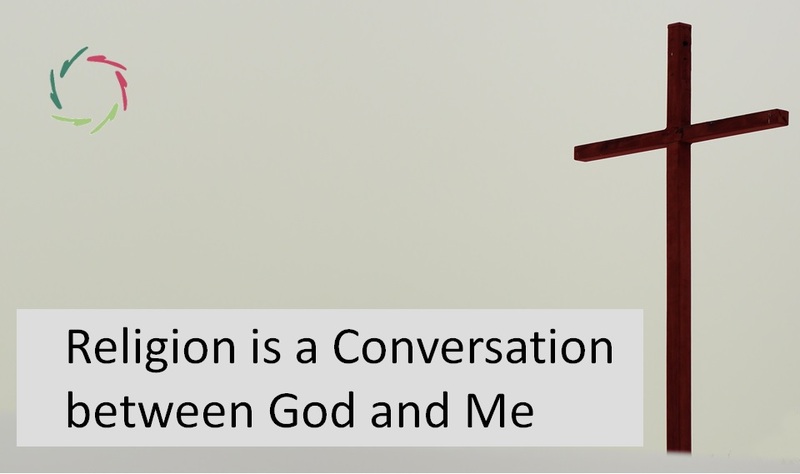 See the whole ‘Open Religion’ project. I think these are quite self-explanatory. Unfortunately, reality is not yet very much ‘Open’. However, I think that we are not far from it. What shows differently may be quite a thin layer. The more I look into the history and present of religions, the more I get convinced of this. But even so, I see much real and possible suffering on the way towards it, if we as a society and as individuals don’t take care. This is not hypothetical. It’s going on. Therefore, I think the following is extremely important. 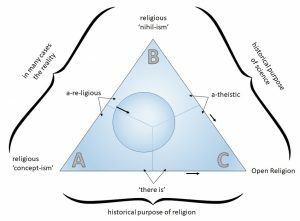 In an evolution towards Open Religion (C), either coming from (A) or from (B), it’s important to reach for achieving a ‘gentle slope’, as in this drawing. The ‘Open Religion’ project is meant to prepare such gentle slope towards fully Open Religion (the area at the bottom of the drawing, being prepared in the meantime) in which people can feel at home with their religious feelings without necessity of any objectification at all. In this, people can feel free at last. 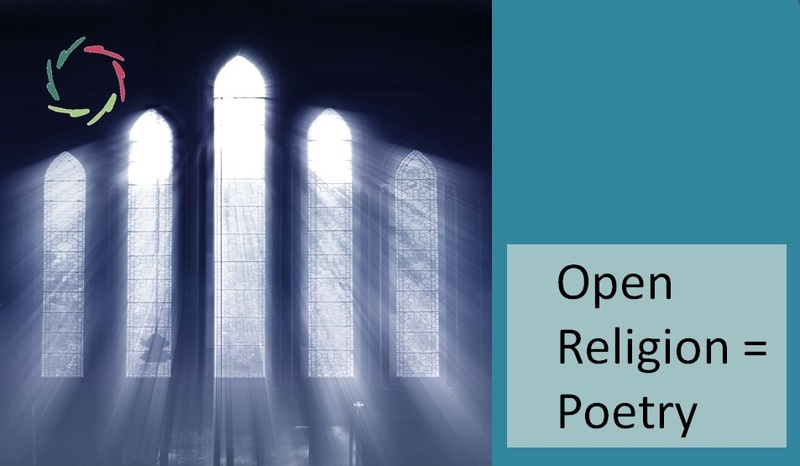 Thus, the project is about ‘opening religion’. The blogging texts that you find online within the AURELIS blog are meant to be a continuous invitation, a suggestion to relax ‘hard’ concepts towards a much gentler way of dealing with them. It’s a pity that many individuals harshly drop out of their faith, fall to a god-less bottom-of-the-abyss, and hurt terribly. This may also be why many prefer fundamentalism instead. The ‘Open Religion’ goal is not to tear people by force out of their present state, whatever this may be. That is not needed at all. One can retain what one finds deeply valuable within one’s religious setting. This is about deeply human values. As a general admonition if you are on this path: don’t lose anything deeply valuable to you. There is eventually no need to. If you feel that it happens to you nevertheless, please think more and deeper. What bad thoughts or feelings may come to you, is not an indication of what you’re going to if you’re doing it well. Moreover, evolving through a gentle slope is also the best way to let ‘Open Religiosity’ grow inside. It’s just, plainly, efficient. NOTE: as Open Religion is different from any concrete religion, ‘Open Mindfulness’ is different from Mindfulness. Of course, most important in this is that people should really be free and feel free to go this way if they feel personally ready. After all, any kind of worthwhile religiosity is impossible if it’s not experienced in a setting of freedom.